The figure above shows the schematics of a typical submarine hydothermal system (SHS). The magma at the hottest zone is about 1200°C. 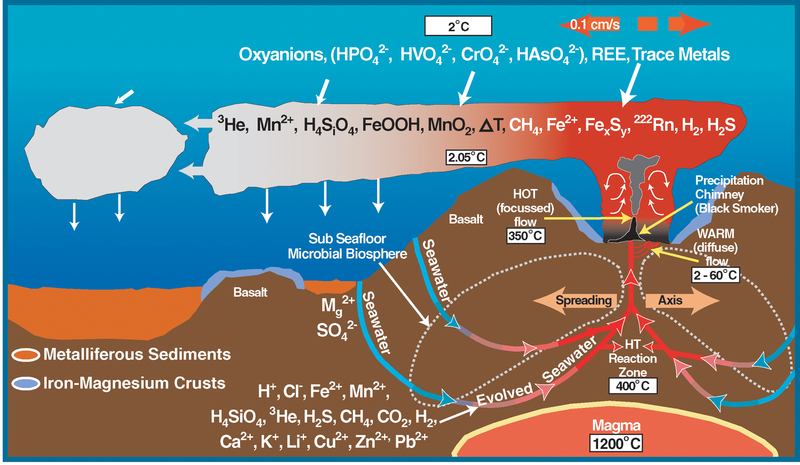 Seawater from the sea penetrates into the crust of the spreading axis (down flows) and towards the “reaction zone” which is about ~400°C. Seawater-rock interaction happens here, the water is then released through and is cooled down rapidly by cold seawater. A quenching effect takes place here. The abundance of minerals and/or metals are also part of the system. Some of the chemical composition of a typical black- smoker type of SHS is shown here. 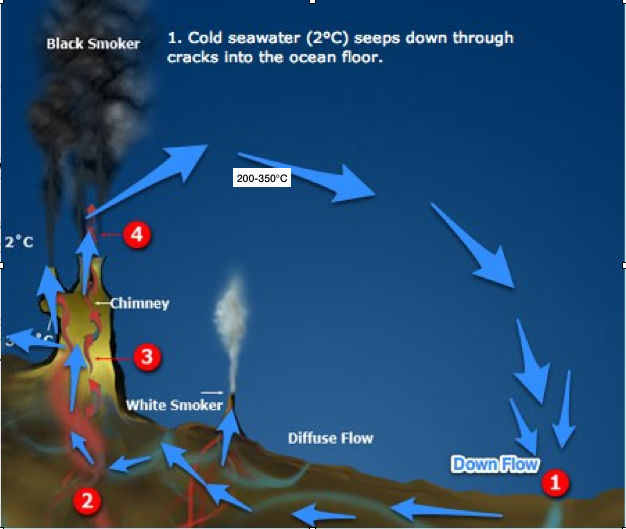 The diagram above represent what we typically call a black-smoker, A black smoker is a type of hydrothermal vent typically found in the abyssal and hadal zones. Common pictures on SHS are generally black smokers. They appear as black chimney-like structures that emits a cloud of black material containing high levels of sulfur-bearing minerals, or sulfides. Black smokers are formed in fields, hundreds of meters wide when superheated water from below earth’s crust comes through the ocean floor. This water is rich in dissolved minerals from the crust, most notably sulfides. 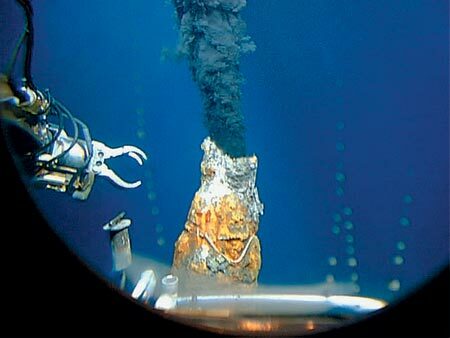 When it comes in contact with cold ocean water, many minerals precipitate, forming a black chimney-like structure around each vent. Effluents from black smokers are acidic (pH 2-3) and are rich with transition metals. All the fluids gives out nutrients to all the unusual organisms at the area. Google it!!! 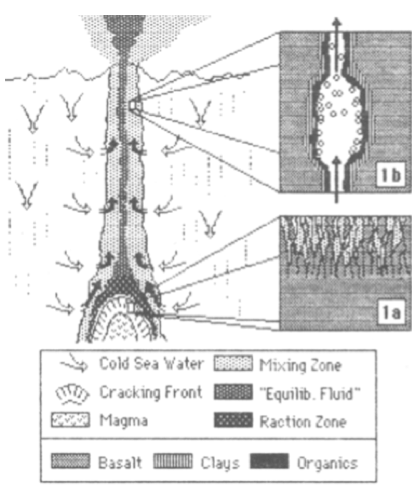 On the other hand, a diffuse flow is an area where hydrothermal fluids flow out instead of a chimney. The fluids from here are much cooler and slower compared compared to a typical SHS. Minerals are usually left behind in this fluids. 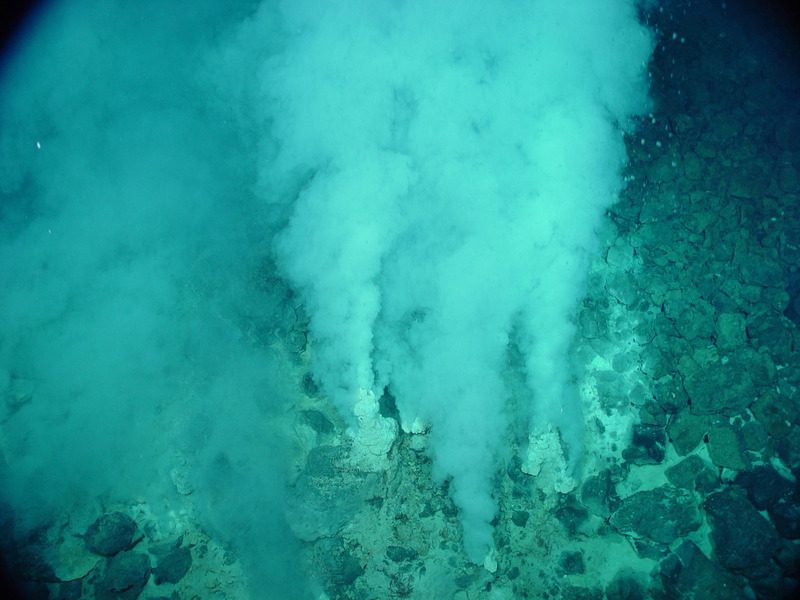 White smoke appears to come out of the sea floor, hence the term white-smokers were coined. Unlike the black smokers, the fluids coming out of here lacks minerals which comes from their black counterparts. These two type of smokers are typical in a SHS environment. 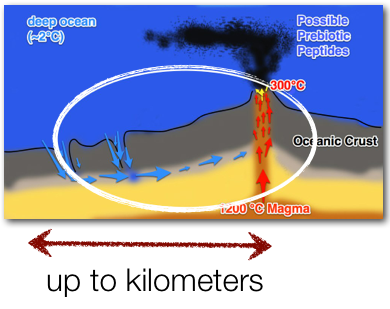 It is speculated that SHS could have existed throughout earth’s ocean, this subsequently fueled the idea that life could have started here, together with the heat loving bacteria. So far, the experiments of SHS are done with simulators at laboratories mainly in Japan and the U.S only. 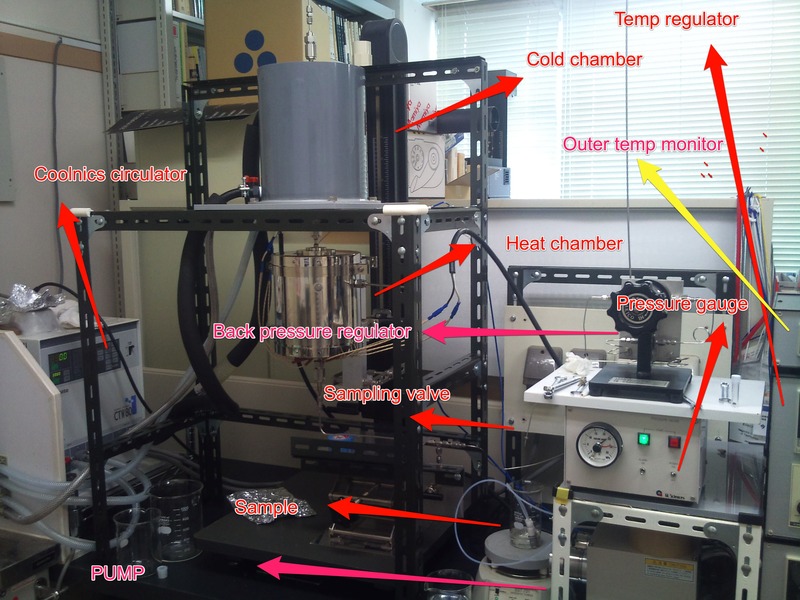 Research using simulators usually utilizes basic chemicals exposed to heat and pressure similar to the vent system (so far the black smokers). Another area of interest is to see the survivability of common bio-molecules such as amino acids in SHS simulators. 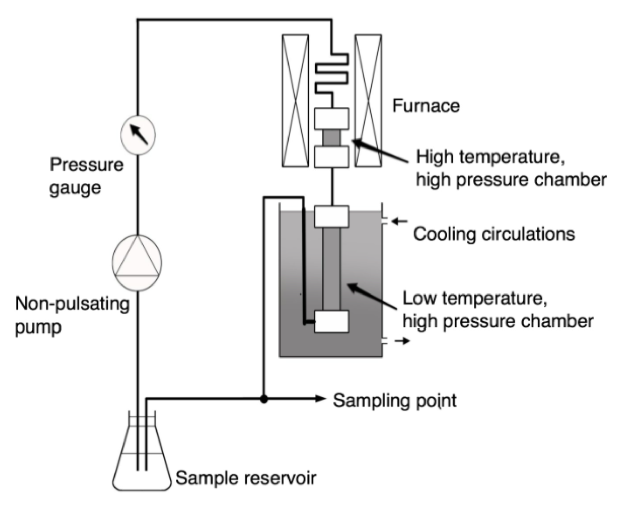 This is important as data from these kind of experiment usually presents the thermal and pressure limits of the chemicals used in life’s processes. We know now that amino acids (not all) can survive in SHS simulators, which gives a good account to SHS being a good spot to origins. On the other hand, genetic materials (DNA and RNA) are instantly destroyed when exposed to the simulators. This proves to be a difficult scientific problem to solve so far. In the next post i will be posting briefly about the LOST CITY type of hydrothermal systems, an entirely unique system and will follow with the various kind of SHS simulators i have used before.